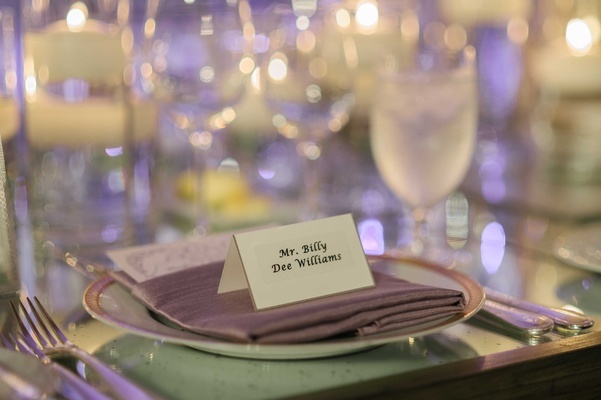 When guests received the stunning, bespoke invitation suite for the wedding of Meaghan Roberts and Je’Caryous Johnson, they also got a clear indication of what to expect from the event itself: custom details, a violet color palette, and a contemporary twist on classic elements. 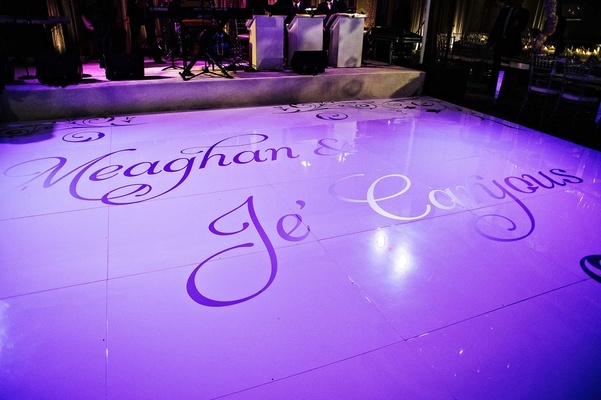 “I wanted a traditional theme with a touch of modern,” says Meaghan, who commissioned a timeless stationery design etched on die-cut sheets of Lucite instead of premium paper. 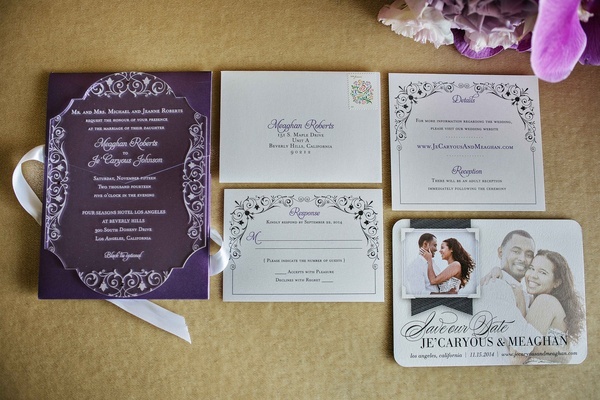 Letterpressed inserts in lavender accompanied the cutting-edge invitations, which were delivered in royal purple envelopes to 250 loved ones. 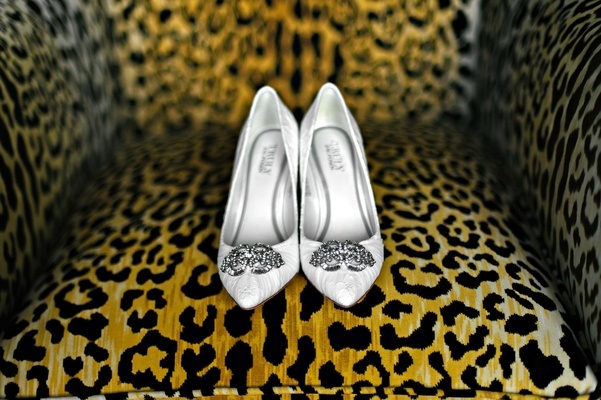 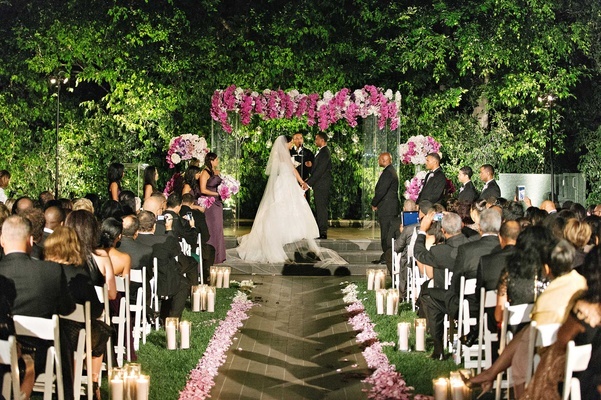 The couple chose to host their nuptials in the Los Angeles area, where Meaghan completed college and law school. 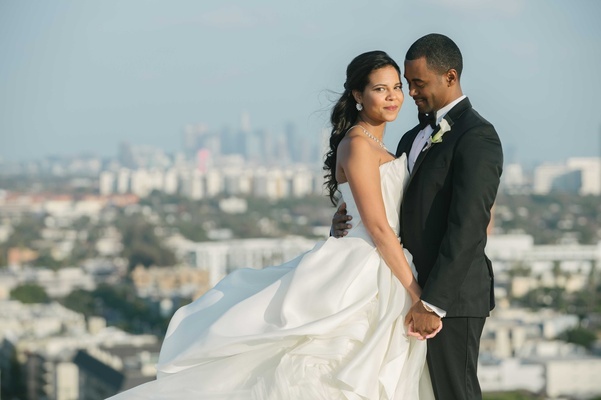 “Los Angeles is one my favorite cities, and since Je’Caryous and I knew that many of our family and friends had never been there before, we thought it would be a great opportunity for them to experience it,” she explains. 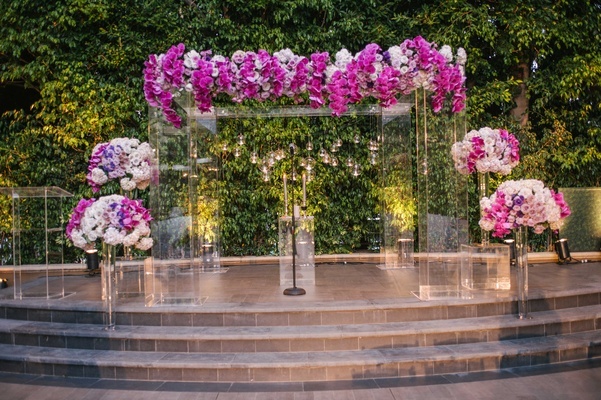 For the ceremony, an exquisite gazebo of crystal-clear Lucite was erected on a raised platform within the property’s landscaped Wetherly Gardens. 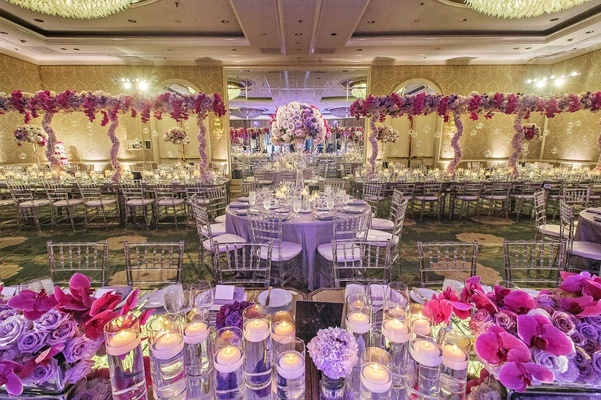 Flowers ranging from the palest lavender-tipped hydrangeas to violet lisianthus blossoms were woven between vivid garlands of aubergine orchids all along the top of the structure, while votive candles in blown-glass ornaments were suspended from the back. 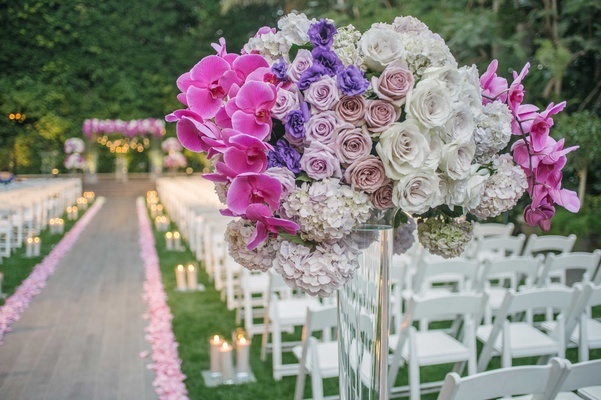 Additional arrangements featuring the same combination of florals decorated the altar and entrance to the candlelit aisle. 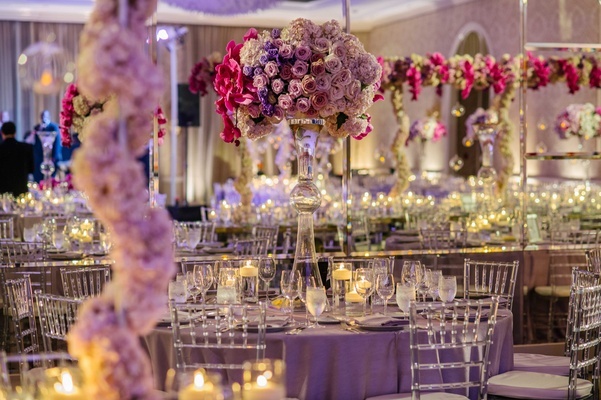 The bridesmaids’ formal floor-length gowns were a lovely shade of byzantium that brought out the mulberry and magenta hues in their beautiful mixed nosegays. 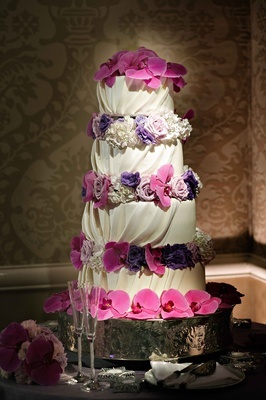 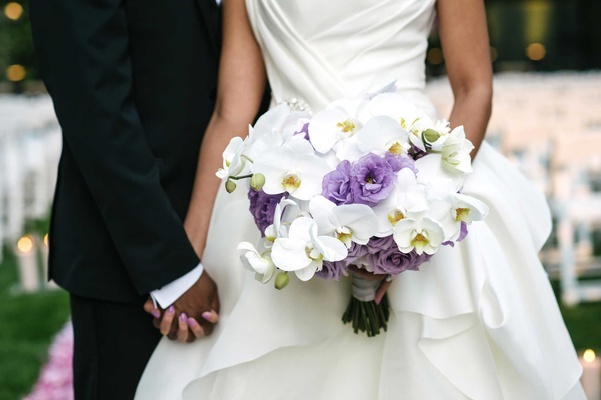 Mauve roses mingled among delicate stems of white phalaenopsis orchids to compose the bride’s bouquet, and a sweet pair of flower girls wore floral crowns in a pastel shade of violet. 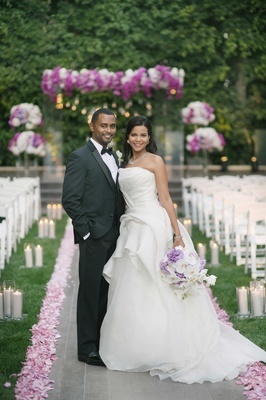 Meaghan’s lissome Vera Wang gown swirled with asymmetric layers that were draped and tucked with strategic pleating, the shirred bodice accented at the waist with a sparkling crystal brooch. 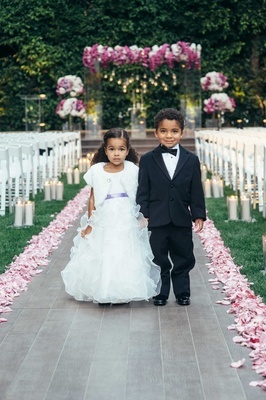 The groom and his honor attendants were turned out in smart black tuxedos, including a dapper ring bearer who coordinated flawlessly with the men. 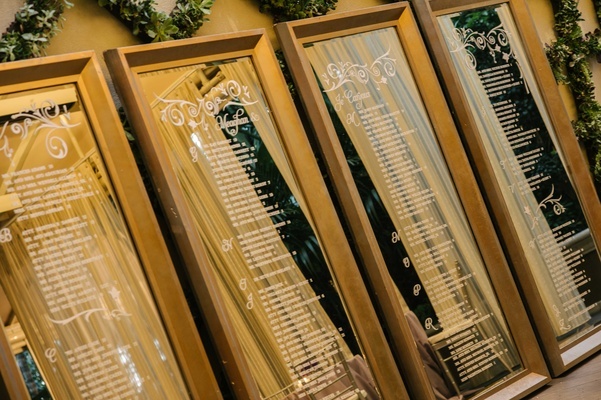 Guests found their seating assignments for the reception etched on a series of framed mirrors that featured the same floral design that decorated the couple’s invitation suite. 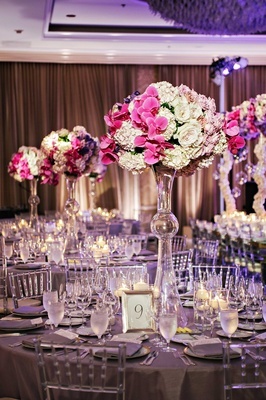 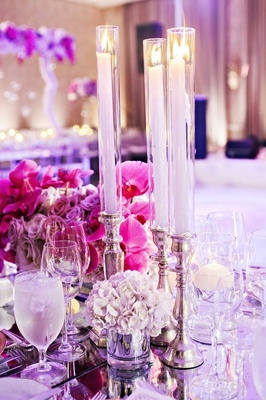 The ballroom echoed the look of the ceremony décor with Lucite chairs, copious candlelight, and lush arrangements. 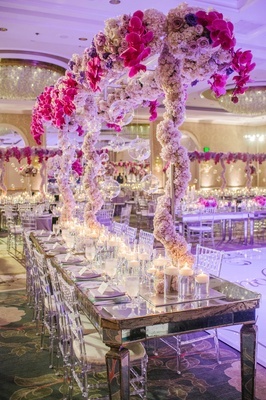 “There were tall pillars with orchids cascading down on the round [tables],” Meaghan describes, “and we had a few rectangular tables with orchids bridged across them.” Gleaming metal scaffolding held the flowers aloft, including pink hydrangea garlands that wrapped gracefully around the length of the structure. 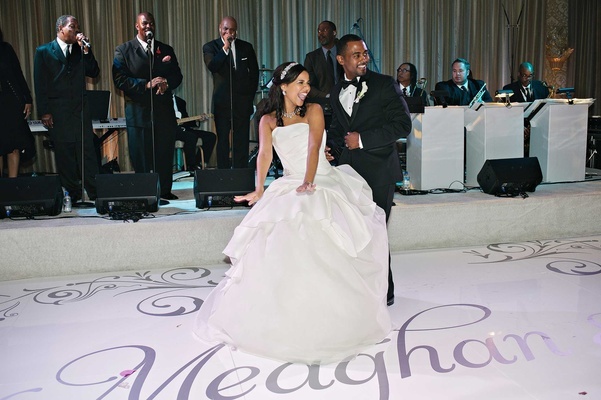 Je’Caryous and Meaghan took to a personalized dance floor for their first turn around the room as husband and wife, serenaded by a special performer. 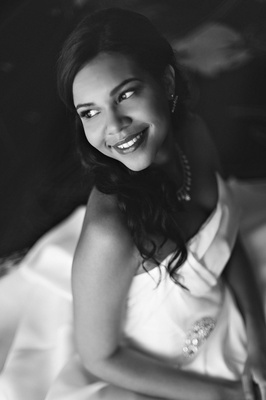 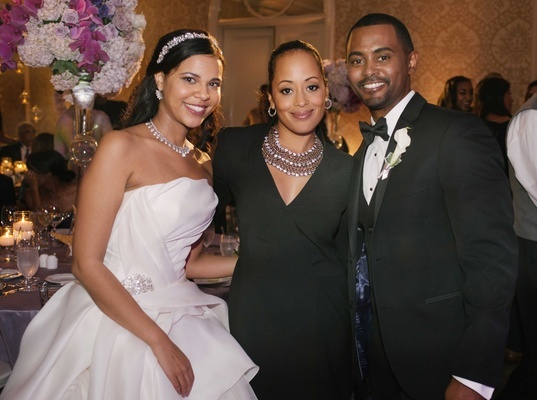 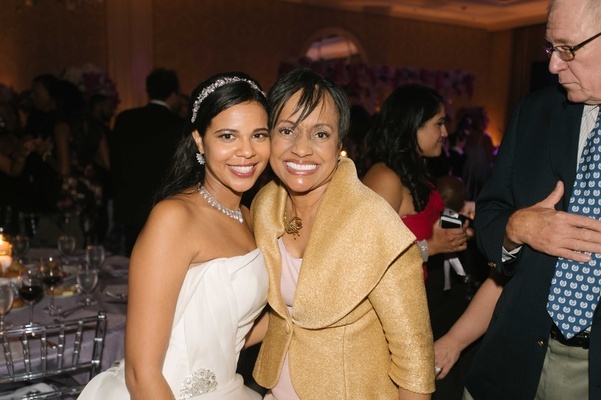 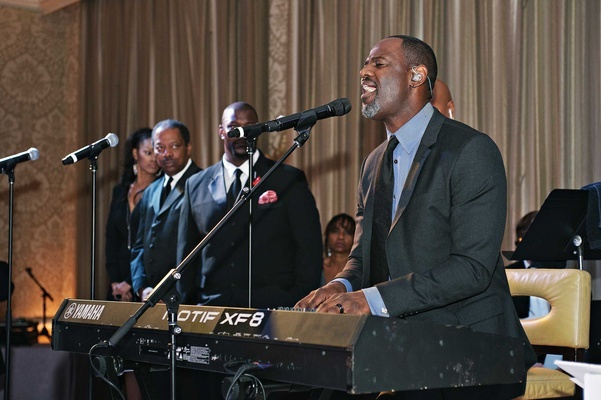 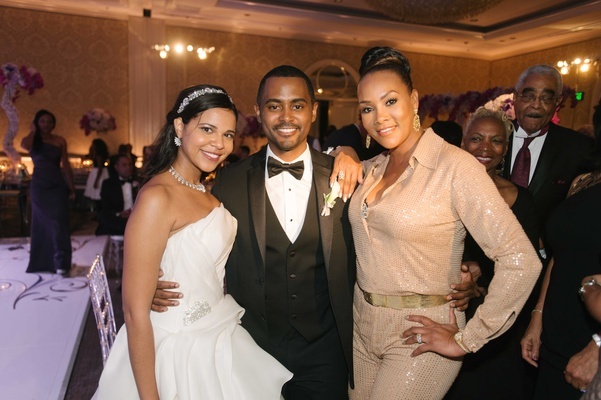 “Brian McKnight singing our first dance song was definitely memorable,” confirms the bride. 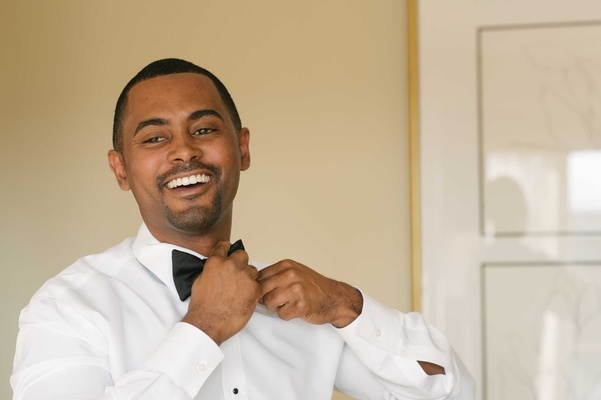 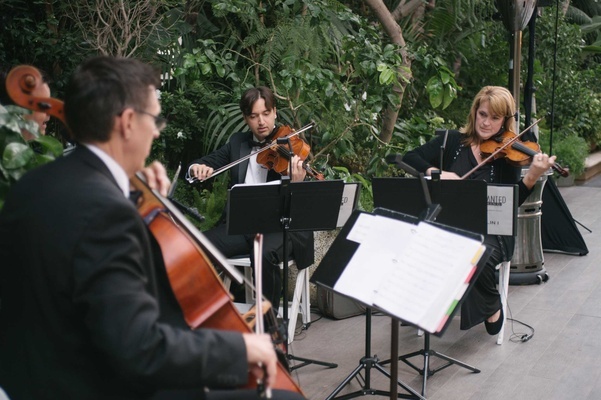 “All of the music and entertainment at the reception was fantastic, I’m told – but I don’t remember much except Brian McKnight singing for our first dance,” the groom seconds.